Because of the USAF Thunderbirds recent stand down we’ve received numerous questions regarding their participation at the 2018 Thunder of Niagara International Air Show. 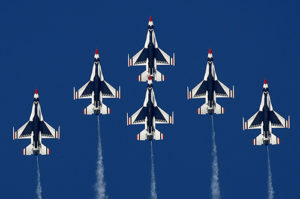 The Thunderbirds returned to practicing their demonstration on April 18th. We expect an update on the Thunderbirds air show participation status within the next two weeks. VIP Ticket Launch is May 17th at Noon! As a result, we have decided to delay our VIP ticket launch until Thursday, May 17th at 12:00 PM (Noon) ET. This delay will give the Thunderbirds time to assess their schedule and confirm their participation at the 2018 Thunder of Niagara International Air Show, before we put VIP tickets on sale. The Air Show will take place June 9 & 10, at the Niagara Air Reserve Station in Niagara Falls, New York! This year’s show represents one of the best air show line-ups in North America. As always, the air show is FREE to attend. This includes FREE parking and shuttle bus service on air show weekend. VIP tickets represent a premium air show experience. As in 2015, VIP tickets are expected to sell out. Keep a sharp eye on your inbox for important VIP ticket details and updates! NEW Niagara Web Site Launch! The BRAND NEW 2018 Thunder of Niagara International Air Show website, with all the details you want to know, will go live on Monday, May 14th at 12:00 PM (Noon) Eastern.